(Pooler, Georgia) March 14, 2019— Living up to their “Our People Matter” mantra, Effingham Health System honored over 70 employees during their 2019 Employee Appreciation Banquet. 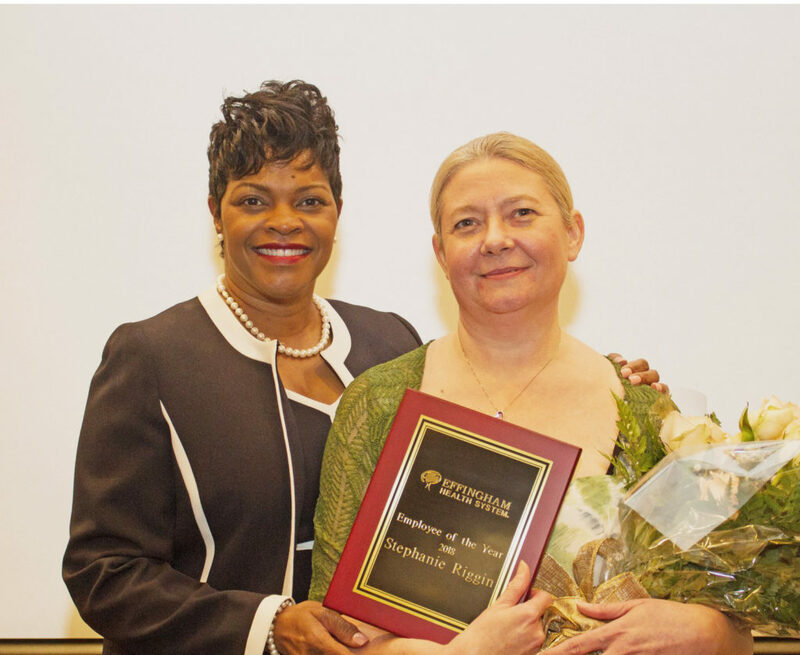 Karen Harden-O’Neal, HER TITLE, was honored as Employee of the Year. Outstanding Service Awards went to Ashley Mitchell (department), Marilou Howe (department), and Richie Burns (department). The annual ceremony honors excellence and service from across the entire healthcare system, which employs approximately 450 people. Effingham Health System also conferred Pillar Awards (for Quality, Patient Experience, Financial Performance, and Strategic Growth), Leadership Awards, and Service Awards for notable anniversaries. Among those recognized for extended service with Effingham Health System was Bertha Scott, HER TITLE, who was recognized for 45 years with EHS. See our photo gallery of Award Recipients. Effingham Hospital Staff: for achieving a CMS four-star rating for second year in a row. Accepting: Nancy Fleming, Jennifer Floyd, and Dr. John Bennett. Effingham Care Center Staff: for achieving a CMS four-star rating for second consecutive year. Accepting: Susan Collins and Christie Lumpkin. Effingham Family Medicine and Pediatrics Practices: in Goshen, Guyton, Pt. Wentworth, Rincon, and Springfield: for achieving 97.8% patient satisfaction scores for the last two years. Accepting: Kathy Sydow and Maggie Palmer. Financial Services Department. Accepting: Al Allred. Surgical Services. Accepting: Nancy Flemming, Tim Brantley, and Dr. Alexander Wynn.